Knees of Fury 32 is complete and the results are in. Paul Slowinski exacted a decisive revenge win against Thor Hoopman who he stopped in the first round. In their prior meeting Hoopman was able to outpoint Slowinski for the win. Slowinski has been fighting actively in full rules Muay thai bouts since his time away from the troubled K-1 promotion in Japan. This win signifies an ongoing run of victories by Slowinski in his ongoing return to full rules Muay Thai competition. 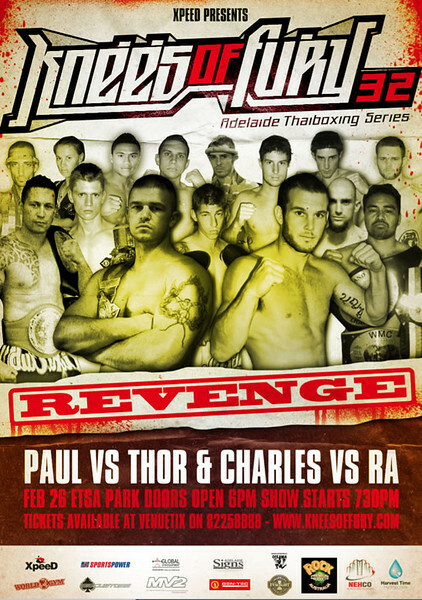 Paul “The Sting” Slowinski (SA) stops Thor Hoopman (Queensland) in the 1st round. Kym Johnson (SA) vs Wes Capper (WA). Wes Capper stops Kym Johnson in the 1st round. Both had 3 eight counts put on them from punches. Flip Street (Queensland)beat Myles Simpson (SA) after Simpson didn’t come out out of his corner after round 2. Sarah O’Connell (Queensland) beats Tenille May (SA)on points. Charlie Chau (SA)won over Hiki Hanui (New Zealand) by 1st rd stoppage due to leg kicks. Cameron Murcott (WA) wins over Steve Behan (SA) in the 1st round. ~ by fatsoking on February 26, 2011.